Oh how I love thee, Laughing Cow cheese. I like to eat you straight out of your little foil wrapper with the cute red pull-tab. Even better than plain, you make everyday snacks indulgent. I spread you on baguette bread. Spear you with pretzel sticks. Dab you onto apple slices. And with only 1 WW point per wedge, it is extraordinary the amount of flavor you deliver. Your Mozzarella, Sun-dried Tomato and Basil version in particular makes me oh so happy. I like to spread this one on a sandwich thin and top with scrambled eggs made in the microwave at work. Or smash into scrambled eggs at home. Or spread on a scrambled egg wrap. 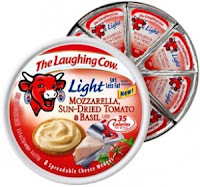 And to think, you can even be the newest cheese I use on one of our pizza creations! I signed up for their monthly newsletter to get more creative food ideas delivered right to me. Hungry Girl has a bunch more. 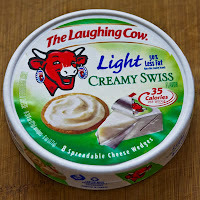 Who else out there is Laughing Cow's biggest fan? Be on the lookout for the Sunday paper coupons on these as they are a little pricey otherwise, coming in around $3 a pop. Not like that stops me from buying them anyways, though! 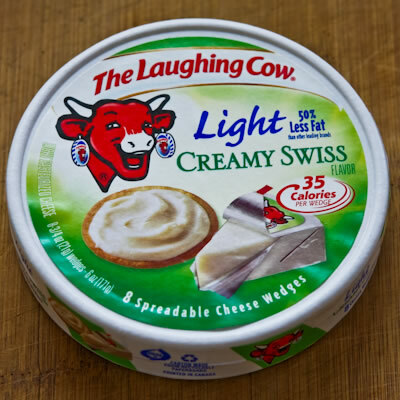 Disclosure: I do not work with Laughing Cow, but goodness gracious, am just totally in love with them. Me me me!!! I've been eating them like crazy lately. I mean, ONE point!! I do like that new sun dried tomato one, hmmm, good. Karen - I remembered you are a fan ;) Looove this stuff! !